Never stop learning. This is the mindset that my parents inflicted on to us as children and I’ve carried this through with me to my adult years. As a result of this, I am naturally curious by nature. I want to know everything. I’m always asking why and when I don’t know the answer I go I find it. I guess that’s why this year I decided to further my studies to help me grow as a personal trainer. 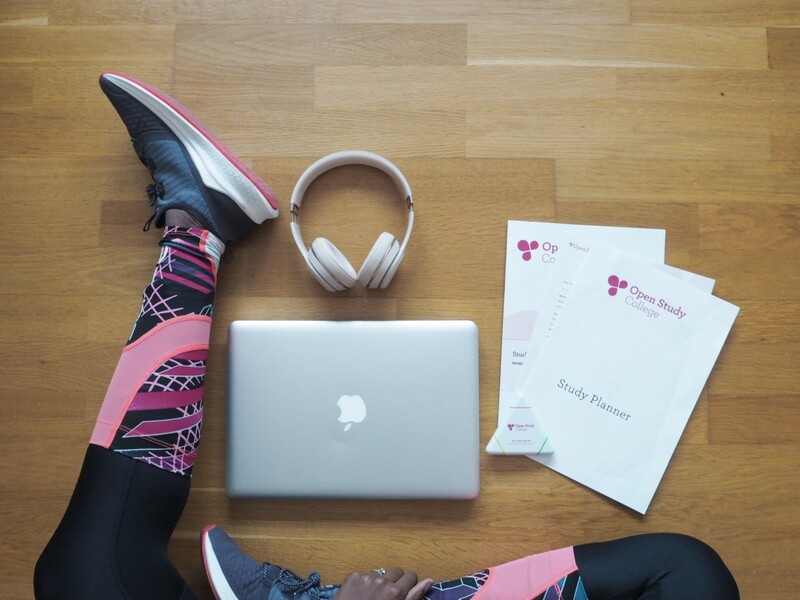 And if you’ve been following my blog or social media, you’ll know that I have been studying for my level 2 certificate in Nutrition and Health with Open Study College. I’ve been studying since January and now that we’re on the edge of falling off February and on to March, I thought I’d share my experience with you and take you through the process. If you’re thinking about progressing your current career, getting a competitive edge or starting a new career completely, here’s everything you need to know about Open Study College and why a distance learning course could help you take the next step. Open Study College has a wide range of course for you to choose from, no matter how far or early on you are in your career. You might be a personal trainer looking to do your level 5 diploma or a marketing professional who graduated in the 90s and wants to get to speed with the latest digital trends. Once you’ve picked your course you’re pretty much good to go. Online students will receive course materials within 72 hours and those with the course pack study method will receive their course materials within 10 working days. You can study at your own pace which means it’s nothing like college or university. Long gone are the days where you had to pull an all nighter to finish an assignment because your social life got the better of you during term time! Having the ability to study at my own pace was a huge selling point because I work fulltime. Sometimes I get home and all I want to do is absolutely nothing. Other days I literally work for hours. I wanted a course that was completely flexible and I often find that part time courses don’t always cater to the daily demands of everyday life. With OSC you can study your way. At your own pace and from the comfort of your own home. Or a beach for that matter! Being able to study at your own pace means that you’re able to dictate how long you spend on each module. You might fly through module 2 and spend weeks or months getting your head around module 3. And that’s completely fine! You get to decide when you submit your assignments which takes the pressure off that usually comes with studying. Like I said, the days of pulling all nighters are long gone! I think one of the reasons why we get stuck in our ways as we get older is because life is expensive. Most of us, myself included, cannot afford to take a care break. We can’t afford to stop working to pursue an unpaid passion. And because of this, we find ourselves stuck in a rut and in a job or career we no longer enjoy because we need to pay our bills on time. Of course, paying your bills on time is important but so is pursuing your passion, which is why OSC have different payment options. You can pay for your course up front, or over a number of months. The courses themselves are actually really reasonably priced too. The Nutrition and Health course that I am enrolled on complements my personal training qualifications and will allow me to give sound advice on nutrition and health. And it’s costs as little as just £13.36 a month, which is pretty amazing. I love that OSC are making courses and education more accessible, which could allow you to make your next career move a lot sooner than you think. There’s also a 14 day money back guarantee. So if you enroll on a course and decide that it’s not the right one for you or your circumstances change, you can cancel your course, providing you return all course material to us within fourteen days. Full T&Cs can be found here. Although the all courses are distance based learning, you’ll be assigned an online tutor who’ll be on standby to help answer any questions that you might have. They’ll be there to guide you throughout the entire process, which means you’ll receive the same level of teaching and guidance that you get from a full or part time course. Your tutor isn’t there to police you either. So don’t worry if one week you fall behind…no one is going to judge you. I don’t know about you, but when I finished both my undergraduate degree and my masters degree, despite being qualified up to my eye balls I didn’t know what to do next. I didn’t know how to write a CV. Luckily, my husband helped me out and my sister also helped me with my cover letter. Both of whom are older than I am so they had been through process before. One of the major benefits that come with doing a course through Open Study College is that you get to gain access to their free CV writing service. I don’t think I really understood the value of a great CV until I settled into my career and started hiring a team. You might tick all the boxes but if the ticked boxes cannot be seen on your CV, how is the recruiter to know the extent of your skills? I’m so thankful that I was able to do this course with Open Study College. It was the first distance learning course that I have ever done and I loved how easy it is to fit studying into my everyday life. I really hope you find this useful and if you’ve got any questions please leave them below! Previous Post Motivation and how to stay committed to distance learning.